One thing that is often confusing to any network engineer (regardless of level) is the version and naming structure used by Cisco for their IOS images. Although the naming used for some of the newer devices is changing to a simpler structure, it will be a while before all the different versions are consolidated. This article covers these different releases and aims to give a single location where network engineers can look to figure out what the different releases mean. Although this is not an exhaustive list of every Cisco version, it does cover the most commonly used versions. Early Deployment (ED): These releases provide both new features and new platform support in addition to bug fixes. Limited Deployment (LD): These releases do not include any new features or platform support but do include bug fixes. LD releases are between an ED release and a GD release. General Deployment (GD): These releases can be used anywhere in a customer network with the same feature and functionality requirements. These tend to be stable on almost all platforms. Maintenance Deployment (MD): These releases are used to provide additional support for bug fixes and ongoing software maintenance. With IOS 15 and later, both the LD and GD deployments will be retired. New releases will be considered either ED or MD. The IOS train paths have also been consolidated. 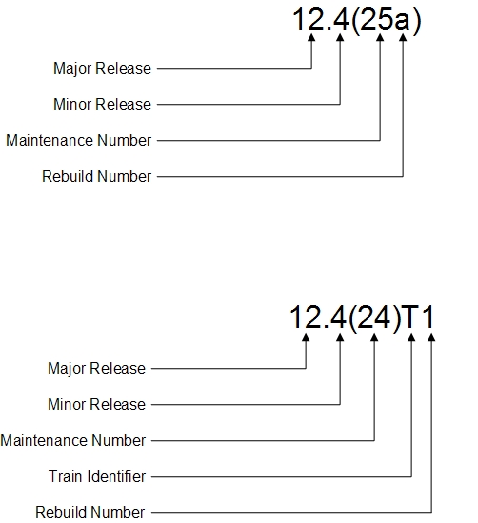 With earlier versions of IOS, the different ED (T trains; for instance, 12.4T) and MD (not T trains; for instance, 12.4) has different code bases. With IOS 15 and later, the code bases will be consolidated. MD releases (called M releases, or extended release) will be released and have a 44-month support window, whereas ED (T releases, or standard release) will have a 18-month support window. A number of different versions exist within each release of IOS. This article takes a look at a few of these and how what they are used for. With IOS Version 12, many different sub-versions of IOS exist, including specialized support for specific platforms; the next few sections cover a couple of the most common. IOS Version 12 has a few different ways to notate version, including those shown in Figure1. The T train is used to add the newest features and platforms. After the software has been tested thoroughly, it is rolled into the mainline release. Many different IOS versions provide support for specific platforms. The ones shown in the section name are an incomplete list but do show some of the common examples. The 12S, 12SB, and 12SR versions tend to provide support for Cisco’s 7200, 7300, 7400, 7500, and 10000 platforms. The way that different versions are referenced with IOS Version 15 is similar to that of IOS Version 12. 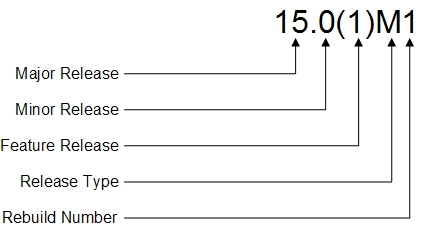 IOS Version 15 has a notation that is similar to IOS Version 12 and is shown in Figure2. As with IOS version 12, IOS Version 15M provides a mainline release and is also referred to as a maintenance release. As with IOS version 12T, version 15T is focused on new features and platforms and is supported for a shorter amount of time than the maintenance releases. After 15T releases have been tested thoroughly, they are wrapped into the next 15M release. As with IOS Version 12, IOS Version 15 is going to have a number of different versions that are specific to new equipment that needs to support new features (specific to the platform). For IOS Version15, some of those currently available are Version 15X (special or early deployment), 15S (7600), 15Y (Sup-2T-10GE–Catalyst 6500), 15SG (Sup-CS-S2T–Catalyst 6500), and 15SE (2960, 3560, 3650, and 3750 platforms). The way that Cisco has named their IOS packages has changed over time. With IOS Version 12.3 through 15, this has remained relatively constant. Figure 3 shows the eight different packages that are available. Of course, this can get confusing. In an effort to make the software licensing process simpler and provide operational savings, the way that packages are created has changed with the new Integrated Service Routers (ISR) Generation 2. With these devices, a universal image is shipped on each one. The functionality provided by the image is dictated by the features enabled with a license key. Each of these is then able to be added together to obtain the features required in each situation (for example, UC + Security or Data + Security). Well, leave it up to development to have a structure that makes sense to only a small number of people. This certainly seems to have happened with the various iterations of IOS. This article should enable current and new network engineers to break down what every image provides so that future IOS version selection becomes easier. Let’s hope that going forward the model being used for the newer ISR G2 will be used. At the very least, this will make the selection of the most appropriate IOS image feature package possible without considerable time spend with Cisco presales. Build or extend applications across your routers and switches, to servers and new business platforms. Automate current services or create new ones on demand, when and where you need them and faster than ever. onePK makes your network more powerful and flexible while giving you the control you need. The tools you already use: Eclipse, NetBeans, and more. Run it on any server or right in your network. Our early adopters are using onePK for new applications, service automation, and more. 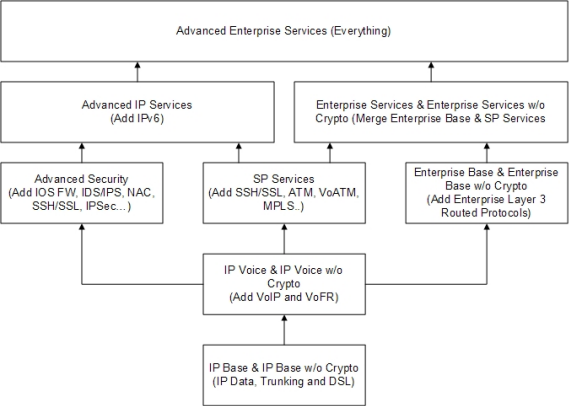 Create flow-based services such as QoS. Enable applications to adapt to changing network conditions such as bandwidth. Automate workflows spanning multiple devices. Cisco IOS XR Software, a member of the Cisco IOS family, is a unique self-healing and self-defending operating system designed for always on operation while scaling system capacity up to 92Tbps. Cisco IOS XR powers the Cisco Carrier Routing System, enabling the foundation for network and service convergence today while providing investment protection for decades to come. Cisco IOS helps establish a transition to next generation platforms. It gives you the tools to navigate the dynamics of the ever-changing business models that are transforming Internet and intranet use today. Cisco IOS XE software is a result of the continuing evolution of Cisco IOS. This software provides a modular structure that delivers full Cisco IOS feature functionality. Cisco IOS XE helps ready your network for future developments and changes. The Cisco IOS XE modular structure significantly enhances the software quality and performance by separating the data plane and control plane. Feature velocity is optimized by running Cisco IOS Release 15 in this state-of-the-art networking software. What’s the Order of Operations for Cisco IOS?